This is the place to discuss, ask questions and otherwise post information, anecdotes and tips for turning buses into motorhomes. A steady increase in the number of visitors to the site asking questions about the conversion process and questions about bus bodies, maintenance and so on has lead to some members asking us to establish this section. Not sure if you are the person I go too with this but how long does it take to get PM status. I have a few sent to me but am unable to reply as yet. You should now have it. I have done replies to PM But they are just sitting idol in the outbox. Is there something else I need to do. One has been in then outbox for hours. I think I have worked out that the message will stay in my inbox until the PM recipient logs into the forum?? Actually, I think until the recipient actually opens it. At least I'm on the right track now. I am an owner of an AEC Swift, 1981, am looking for anyone who has knowlegde of them and info on various questions. It has been converted to a motorhome, we love the bus, have some mechanical questions about it. So, if that is YOU....please answer threw the forum. Cheers, O.E. hi guys, just joined, not sure if this an immediate ban but i`m from ireland (and unlike the rest of ireland i`m one of the four left here hahahaha), got myself a british leyland "swift" midi bus, plan is to transform her into the family motorhome, my dad builds them from panel vans, mostly transits and the odd iveco as a hobby since he retired so i`ve taken the plunge and deceided to build one myself.. I am new to the site having just bought a 1969 Leyland Atlantean Double Decker with the intention of converting it. While the relocation has not gone to plan with some motor trouble driving it home following the loss of the water pump fan belt, I was wondering if any of the readers have converted a Leyland Atlantean double decker and if so whether they had any tips or words of advice on issues to be aware of and problems to avoid. Any information or referrals would be appreciated. I was also wondering if anyone could recommend a mechanic for this type of vehicle in Brisbane. My usual guys do not have the facilities to work on this size of vehicle as the engine weighs 1500plus kgs. I can recommend CPF Detroit Specialists in Salisbury, they work on a huge variety of stuff, prices are reasonable and staff are knowledgeable. 22 High back fabric seats with 3-point lap sash seatbelts. Hi all, I'm Sarah and I recently bought a 1968 Bedford Bus to convert into my tiny off grid home. I'm really keen to get some advice on removing the rivets in the ceiling panels. I'm thinking to drill them out and then use a chisel to take the front off? Hope you all had a lovely Christmas and New Year! They will usually be 3/16" or 1/8" and you can buy little double ended drills for those sizes. Get a couple! -the head comes off. Keep a pair of pliers handy to remove the head from the drillbit. Easy with a decent cordless drill, put it in reverse to remove the head whilst gripping with the pliers. -or the drill tip goes below the head -then get a slightly bigger drill and take the head off with that. Once they are out and the lining off you can either cut them with a chisel, knock them in to the cavity with a puch or drill them through. I try to drill them with a larger drill until the metal around the rivet is slightly countersunk then knock them into the ceiling cavity. This gives a smooth finish. LifeOffGrid wrote: Hi all, I'm Sarah and I recently bought a 1968 Bedford Bus to convert into my tiny off grid home. Sarah why do you need to take the ceiling down , these old girls with riveted ceilings were good and strong , little squeaking like modern busses. Sounding like a big job to do , I would also assume the metal ceiling would go towards part of the structural integrity of the vehicle , certainly make it stronger. Throw us up some pics to see what vehicle you have. I don't agree with your drill suggestion baggie, the drill end inside the drill can stuff up the internal chuck screw, seen it enough times now to only buy single ended ones, but by the packet, yes. Hell of a job, you must be going to insulate the void ? rustbucket wrote: I don't agree with your drill suggestion baggie, the drill end inside the drill can stuff up the internal chuck screw, seen it enough times now to only buy single ended ones, but by the packet, yes. Quite right. But it wont happen much with a decent chuck. Certainly used to happen to me in the old days. Good tip there Sarah, buy a decent cordless drill with a GOOD chuck. Hand tighten type, not chuck key. Get a spare battery, they dont need to be big batteries if you have a spare and swap as they flatten. 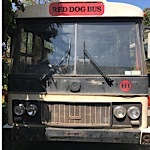 Hi everyone I'm new this this site but looking forward to being a part of it I have been lucky to buy the bus from red dog the movie it's a 1978 bedford blp and am hoping I can get lots of advice and if anyone has one a manual be great. I'll continue looking around the board, while I wait for a reply. lol! Those who say, "There are 2 kinds of people" and those who don't.